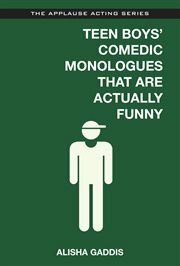 The item Teen boys' comedic monologues that are actually funny, Alisha Gaddis, (ebook) represents a specific, individual, material embodiment of a distinct intellectual or artistic creation found in Charlotte Mecklenburg Library. You wanna be funny for your audition? This book of monologues, written by people who are actually funny for a living, has your back. This incredibly hysterical, cutting-edge monologue book will give the teen actor the extra bang he needs to land the perfect comedic role! Teen Boys' Comedic Monologues That Are Actually Funny features monologues by writers and comics who have written for and/or performed on Saturday Night Live , The Tonight Show , Last Comic Standing , E! Entertainment, Comedy Central Stage, and many, many more. This book is the answer to the comedic monologue needs of teen actors everywhere!